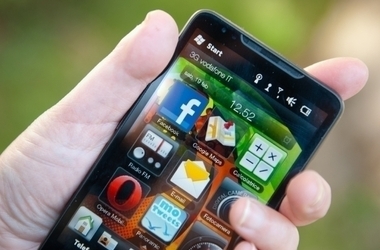 A hand holds a Smartphone which can be used to browse social media sites. Students report laying around staring off blankly with nothing to do and feeling so lonely that they felt like they were in a small cage on a solitary island all because they committed to not using any form of electronic media for 24 hours. In a recent study conducted by the University of Maryland's International Center for Media & the Public Affairs and the Salzburg Academy on Media & Global Change 1,000 international college students voluntarily attempted to not use any electronic media including phones, email, Facebook and instant messenger. Findings from the survey were published in an article by Aemon Lamone on KMPH.com. The article reports that “basically if you're under the age of 25, anywhere in the world, you're likely addicted to some form of media, whether it be Facebook, a smartphone, TV or instant messaging.” The article goes on to say that while media addiction is not clinically diagnosed at this point, the behavior displayed and language students used suggests no small measure of physical dependency. Use Your Time on Facebook Wisely - Like Fastweb on Facebook! Here’s somewhat of a scary thought, during the study one U.S. student reported typing f-a-c-e (for Facebook.com) into the search bar at the start of an internet search and admits to being driven solely by muscle memory and instinct. Even scarier – many students could not make it the full 24 hours and gave in by checking their phones or email. While some may balk at the thought of someone being actually addicted to electronic media - in an article that appeared on NaturalNews.com, a study out of the Harrisburg University of Science and Technology reports that the addiction is similar to a drug addiction and can even be accompanied by symptoms of withdrawal. In the study the university asked the 800-person student population to abstain from social media for a week, what they found was students who behaved like smokers, sneaking off to check their smart phones the way a smoker sneaks off for a cigarette after class. The same study reported that excessive use of social media can increase stress levels, ruin sleep patterns and even degrade meaningful personal relationships. The habit can so quickly become an addiction scientists say it can literally “ruin people’s lives.” Think you might be becoming an addict? Here’s a few suggestions from the article “5 Ways to Fight Social Media Addiction” which appeared on SocialTimes.com on how to stop the disease from setting in. •	Limit the number of social networks you use to those most relevant to your life, popular networks include Facebook, Twitter and LinkedIn. •	You don’t need to friend and follow everyone out there. Set borders as to who appears on your social media sites, insist the person has some real connection to you before you follow them or accept a friend request. •	Set a schedule like you would for checking emails for example, this helps users remain productive and focused. And don’t leave social media sites open in tabs on your computer screen, they serve as a constant distraction.